Preheat the oven to 350 degrees. Stir together flour and brown sugar in a large bowl. Cut 3/4 cup butter into the flour mixture with a pastry blender or 2 forks until crumbly. Press 2 3/4 cups of the crumb mixture evenly on the bottom of a lightly greased 13 X 9 pan. Stir together sour cream, egg and baking soda. Add to the remaining crumb mixture, stirring just until dry ingredients are moistened. Stir together granulated sugar and cinnamon. Pour sour cream mixture over crumb crust in pan. 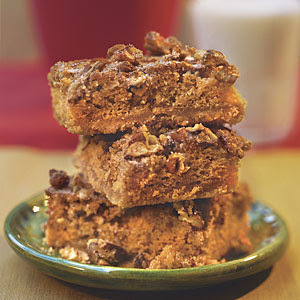 Sprinkle with cinnamon mixture and pecans. Bake at 350 degrees for 25 to 30 minutes or until a wooden toothpick inserted into the center comes out clean. Let cool in pan on a wire rack for 30 minutes. Serve warm.